It's been four years since I posted my original recipe for spreadable vegan butter! I've made it so many times since then, and it's gradually evolved into a much improved version, so I thought I'd share it! This spread has more depth of flavour than the original recipe, and is closer in taste and texture to dairy butter. The main differences are the addition of miso and cashews, and I've left out the natural food colouring this time; it's a pale yellow anyway, but if you'd like it to be a sunnier yellow, feel free to add some colouring. You might think because of the nutritional yeast and miso that this butter recipe is only suitable for savoury dishes, but like dairy butter, you can use it with sweet things too, and just leave out the sea salt if you'd like unsalted butter. It's not only great as a spread on toast and sandwiches, but it is amazing on corn on the cob, stirred through mashed potato, makes delicious pastry, hollandaise sauce, tossed through noodles or steamed vegetables, added to salted caramel sauce, etc. You can also use it to saute things in the frying pan, but like its dairy counterpart, it burns easily, so keep the heat low. Start by measuring the lecitihin into a small bowl and adding the small dash of boiling water. Stir it and leave it aside for at least 10-15 minutes until the granules have started going soft and translucent, and the mixture is thick and gloopy. Add the lemon juice to the soy milk and set aside for a couple of minutes to curdle, then add it to your blender with the cashews, miso, nutritional yeast, salt and vegetable oil. Blend until thick, smooth and creamy without any graininess. Warm the coconut oil until it's only just melted (microwave is fine) - a few soft lumps remaining is okay, it should not be too warm. Pour it into the blender with the lecithin and guar gum (don't overdo the guar gum - a tiny pinch - or it will have an unpleasant texture). Blend for 1-2 minutes, scraping the sides half way through. The butter mixture will be thick and creamy, Pour it into a small container (about 400-500 ml/14-17 fl oz capacity is perfect). The emulsion can split if it's not chilled quickly, so pop it in the freezer for 30-60 minutes, then transfer it to the fridge and use once it's firm. It will be just the right consistency to spread straight from the fridge, and will keep for around a week. Tofu Sunny Side Up, with sauteed asparagus, on grainy toast. Cut three slices of firm tofu (slices about 1 cm thick). Put them in a bowl, pour about a teaspoon of tamari over them, then cover with freshly boiled water (if you don't have tamari, a pinch of salt will do). Steeping tofu in boiling water just before sauteeing makes it go nice and crispy in the pan. Make a batch of Yolky Sauce either on the stove top or in the microwave (makes enough sauce for about 2-3 serves). I made up this sauce recipe for the yolk of my poached "egg", but it's useful in so many ways where you want a rich, eggy-saucy element (I also used it for my Salade Nicoise Royale). I've started to make Yolky Sauce with dijon rather than English mustard, for a milder flavour, but that's up to you. By the way, the sauce keeps in the fridge for a few days, so you can definitely make it ahead of time and zap it in the microwave to warm through. While the sauce is gently cooking, saute 6-8 stalks of asparagus in a little vegan margarine or butter, adding ground black pepper and a pinch of sea salt. Set the asparagus aside once it's done - we now need the pan for the tofu. PS. Wilted spinach is a nice alternative to asparagus. Take the tofu slices out of the water (no need to pat them dry), add a little more margarine to the pan then add the tofu. To get it nice and crispy, you can turn the heat up a little, but not too high or it can get a tough crust. While the tofu is sizzling, season the "up" sides by sprinkling with nutritional yeast, sea salt and ground black pepper. Check the bottoms at intervals to make sure the tofu isn't burning, then when they're crispy and golden, gently flip onto the seasoned side, just for one minute. Meanwhile, make the toast (two slices - and perhaps a pot of tea too!). Top your toast with the tofu slices (I cut one in half lengthwise so there are 1.5 slices of tofu per piece of toast). Arrange the asparagus on top, then spoon over a generous amount of yummy Yolky Sauce. Tuck into the very best eggs-on-toast alternative in the whole world (in my opinion, that is)! I have never come across knishes for sale anywhere in Australia - I can't believe I've lived a knishless life up until now! I read an article about vegan knishes a little while ago and was instantly won over by the idea of a potato-filled baked dumpling - double carbs! I kind of think of them more as pastries than dumplings, but whatever you classify them as, they're delicious! I have the ebook version of a fantastic cookbook called Olive Trees and Honey: A Treasury of Vegetarian Recipes from Jewish Communities Around the World, which is encyclopedic in its size and scope; I just knew I'd be able to turn to it for a great knish recipe, and it didn't disappoint. Before I move on to knishes, a mini book review... Olive Trees is vegetarian rather than vegan, as the name suggests, and because I own so many vegetarian cookbooks (I was a vegetarian for a long time before going vegan), it has to be something really special for me to buy it rather than expand my collection of exclusively vegan cookbooks, and this book most certainly is very special. The good news is, there are a lot of vegan recipes included, and many other are easily veganised, so it's well worth adding to your cookbook shelf. For me, it's an introduction to different types of dishes and flavours that are completely new to me, and I absolutely love that element of surprise when you run through the ingredients of a recipe and aren't quite sure how it's going to turn out - and everything I've tried has turned out deliciously (the Moroccan Pumpkin Soup, flavoured with cinnamon and ginger, is my very favourite pumpkin soup recipe). Olive Trees is more that just a cookbook too, because it's so rich in background information about the regions, traditions and ingredients. I really love the inclusion of maps showing the way foods have migrated around the world, such as The Spread of Stuffed Cabbage and The Spread of Lentils and Rice - so interesting! It's a five star cookbook in my opinion. I used lovely Dutch Cream potatoes, but also added about a quarter of a cauliflower when I boiled them. Big mistake. Tasty, yes, but my resulting mash lacked the firmness you need when forming knishes, and many of them split in the oven (a problem I didn't have with the spinach and cheese variety). Next time I'll leave the cauliflower out. I wanted to make sure the potato filling was really tasty, so I sauteed two finely chopped leeks and an onion in plenty of margarine, and added those to the mash with some of my homemade cashew sour cream (recipe here), chopped dill, and plenty of salt and pepper. I steamed and chopped a bunch of spinach (stems and tough bits removed), sauteed a leek and onion (both finely chopped), seasoned the vegetables with salt, pepper and nutmeg, then stirred in some cashew sour cream and my homemade almond cheese mixture. If you're wondering about the cheese recipe, I've been making a baked almond and/or cashew cheese based on this recipe for a while now (here's a pic of some of the cheeses I've made). What I've found is that straining the mixture makes little difference, so once blended, I just pile it in to greased ramekins and bake. Another discovery is that when you take it to the blended stage, you don't need to bake it first before using it in pastries such as Spanakopita, Borek and Gozleme (and knishes, of course) - it firms up when you bake the pastries. For my knishes, I blended about a cup of almond meal with some soy milk, a big pinch of citric acid (lemon juice works too), a tablespoon of canola oil, about 1/4 cup nutritional yeast, and a couple of generous pinches of sea salt. Then I folded it through the seasoned spinach, etc, and the resulting knishes are so cheesy and rich, I bet you could fool some dairy lovers with them! Since Olive Trees doesn't have any photos, I had to look up instructions on how to form knishes. There seems to be different ways, but I chose the roll, chop and squash method (here's a good demonstration but the recipe isn't vegan). I do love how they're free-form, so you can make them whatever size you like. I made mine about 3 inches in diameter, but made some tiny bite-size ones too. Since I made two varieties, I topped the potato ones with poppy seeds so I could tell them apart. The knishes are rich and buttery, so I felt I needed something to accompany them that cut through the richness a bit. That lovely magenta coloured side dish you can see in the above photo is what I decided to make - German Red Cabbage with Apples, also from Olive Trees and Honey. This is the perfect accompaniment: sweet, acidic, and peppery (and so pretty!). I won't include the cabbage recipe (you should buy the book!) but here's my veganised sour cream pastry recipe. It also works beautifully for strudel type pastries, pasties, turnovers and rolls, both sweet and savoury. It might be a little tender for the base of a pie, but would also work well as a top pie crust (such as a pot pie). I brushed the formed knishes with some egg replacer mixed with soy milk, but I wish I'd just used arrowroot and soy milk as I usually do because it's shinier when baked and works just as well at making sure seeds stick to it. The recipe says it makes enough dough for 12 knishes, but I made quite a few more than that, probably since my knishes were smaller, and I do tend to roll pastry quite thinly. Combine dry ingredients in a bowl and work through margarine to form crumbs. Make a well in the centre and add cashew sour cream and "egg" mixture, working through with a fork to form a soft dough (add a little water if too dry). Shape into a ball, wrap in cling film and refrigerate for at least half an hour before use. I posted my recipe for vegan whipped cream a while ago. I thought it was about time to post some more of my recipes for dairy alternatives. This cream serves a different purpose to the whipped kind; rather than for decorating cakes and pastries, these are more of a spoonable consistency and are great for cooking, as well as a garnish or accompaniment to sweet and savoury dishes. The best part is they're really quick and easy to make, and you don't need a high-speed blender - I just use a regular stick blender. Be warned though, this is not health, whole or diet food - this is rich, fat-laden cream! If you're looking for a low-fat alternative to dairy, there are plenty of recipes around using silken tofu, etc. These recipes are all about emulating the richness and taste of dairy - but without the cholesterol, and best of all, they're totally plant-based. I've also given details of some variations of the basic recipes. Please report back if you give any of my recipes a try, and I'd love to see photos if you have them. I hope you like them! Cashews I don't soak mine, but that's entirely up to you and what your stick blender can handle. Make sure you use raw cashews. Roasted ones are not suitable. Oil Use whatever neutral tasting oil you like. I often use canola, but sunflower, rice bran, grapeseed, macadamia, or blends of any of those would be great. Just steer clear of any oils with a strong flavour or aroma, such as olive or flaxseed oil (although some extra virgin olive oil is great in the mayo) - and make sure your oil is non-GMO and preferably organic. Non-dairy Milk You can use whatever mild tasting non-dairy milk you like, but bear in mind it might change the flavour and appearance of the cream. You do need to make sure the milk you choose is plain and not too sweet. Also, the sour cream and mayo might not be quite as thick made with other non-dairy milks as it's partly the protein in the soy milk reacting with the acid that thickens them. I use Vitasoy Soy Milky because it's mild and not too beany tasting and doesn't have any overriding vanilla or malt flavour as some soy milks do. All I can say is to experiment, which is what I do! Guar Gum The purpose of the guar gum is to help keep the cream emulsified. You know how sometimes sour cream and mayonnaise split and get a bit watery? It helps stop that happening. The recipes will still work without the guar gum, but the longer you keep them in the fridge, the more likely they are to separate a bit. But that's no big deal, you can always stir it together again. When I say "tiny pinch" I mean a really small amount - less than 1/8 teaspoon. I usually just get some out of the bag on the tip of a pointy knife. Too much will change the texture of the cream and make it heavier and a bit gummy - you don't want that! The reason it's blended in at the end is because it's easier to blend the cashews with the mixture being a bit thinner - the guar gum thickens it up a bit. You can use xanthan gum if you don't have any guar gum, or just leave it out. Citric Acid I use citric acid to give the sour cream its acidic tanginess because it's neutral in flavour, but you can substitute it for lemon juice or vinegar if you like, but keep in mind this will change the taste somewhat. Now on to the recipes... Both the cream and sour cream work really well in soups and sauces. The sour cream makes a fantastic base for dips and dressings too. They're not as prone to curdling as dairy cream, and thicken quite a bit when you cook with them, so if you're making mushroom stroganoff, or pasta sauce for example, there's no need to add any kind of thickener - the cashews do the work! Put everything except the guar gum (if using) into a narrow jug (that cylindrical container you get with your stick blender is perfect) and blend for a couple of minutes with a stick blender, until the mixture is no longer grainy. Add the guar gum once the cream is smooth and blend for a few seconds. The cream will thicken further in the fridge and keeps for about 4-5 days. Double Cream For a thicker, more dollopable cream (great on scones with jam or served with cake!) follow recipe above, but use 1/4 cup less soy milk. It will be trickier to blend until smooth because it's so thick, so you could process the cashews separately until finely ground before you add them to the other ingredients. Single Cream For a thinner consistency for pouring over fruit, steamed puddings and tarts (yum! ), just add 1/4 cup extra soy milk. Keep in mind the mixture will continue to thicken as it chills in the fridge. Sweet Cream Follow recipe for regular cream, but instead of a pinch of sugar, add 1-2 tablespoons of raw sugar, light agave nectar, or sweetener of choice, along with 1 teaspoon of vanilla extract. Put everything except the guar gum (if using) into a jug and blend for a couple of minutes with a stick blender, until the mixture is no longer grainy. Add the guar gum once the sour cream is smooth and blend for a few seconds. The cream will thicken further in the fridge and keeps for about 4-5 days. Lime Sour Cream This is great served with spicy, Latin American food. Replace the citric acid with the juice of a lime, and once blended, stir in the finely grated zest of a lime. It's best if you allow the flavours to develop in the fridge for a few hours. French Onion Dip This is so good... Finely chop two medium brown onions and saute in 2 tablespoons of margarine (I use Nuttelex), adding a heaped teaspoon of stock powder (I use Massel Chicken stock powder) until soft and caramelised and most of the liquid has evaporated, then stir in 2 tablespoons of nutritional yeast (savoury yeast flakes). Leave to cool, then fold through 350ml sour cream with chopped fresh chives, finely chopped parsley, a big pinch of cayenne pepper, and sea salt and ground black pepper to taste. Try not to eat it all before you serve it to your guests. Now, on to the mayonnaise. Not only is vegan mayo the best because there's no raw egg in it (yuck!) but it's also much easier to make. You don't need to drizzle the oil in gradually, with the risk of it curdling, you just throw everything into the jug and blend. 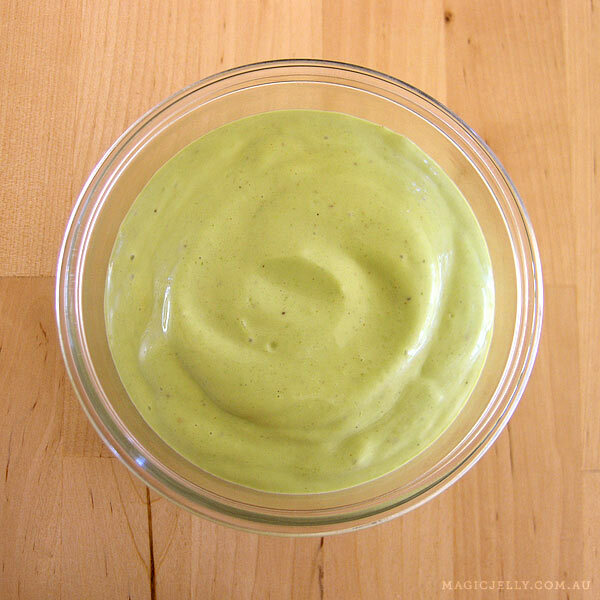 I make this mayo all the time and have made lots of variations over the years. It is much tastier than any of the commercial varieties I've tried. Put everything (including the guar gum, if using) into a jug and blend with a stick blender until thick (a minute or two). The mayo will thicken further in the fridge and keeps for about 5-7 days. Aioli Replace 1/4 cup of the oil with extra virgin olive oil. Use the juice of one lemon instead of the vinegar. Add half to a whole bulb of roasted garlic and a pinch of cayenne pepper and blend. This is a great dip for raw veg. Spicy Thai Mayonnaise Replace the mustard with 1-2 teaspoons of Tom Yum paste (make sure it's vegan!). Replace the vinegar with the juice of one lime. Add an extra teaspoon of sugar and a big pinch of chili powder, then blend. Stir through finely chopped fresh coriander (cilantro). Delicious on a baked tofu banh mi! Sriracha Mayonnaise Replace the mustard with 1-2 tablespoons sriracha. Use lemon or lime juice instead of vinegar. Blend. Smoky Mayonnaise Replace the mustard with 1-2 teaspoons of sun-dried red hot pepper paste, or 1 tablespoon chipotle peppers in adobo sauce, or even 1 tablespoon of tomato paste. Add 1/2 teaspoon of smoked paprika, and use lemon or lime juice instead of vinegar. Add an extra teaspoon of sugar. Blend. Fresh Herb Mayonnaise Omit the mustard and add 1/2 cup loosely packed fresh herbs such as parsley, coriander (cilantro), tarragon, chives and/or watercress. Use lemon juice, not vinegar. Blend until bright green (a few herby bits is okay). Put everything except the guar gum (if using) into a jug and blend for a couple of minutes with a stick blender, until the mixture is no longer grainy. Add the guar gum once the mayo is smooth and blend for a few seconds. It will thicken further in the fridge and keeps for about 4-5 days. Tartar Sauce Use the juice from one lemon in place of the tablespoon of vinegar and add an extra teaspoon of sugar. Fold the following through the mayo once blended: 1 tablespoon finely chopped pickled gherkins, 2 teaspoons chopped capers, 1-2 finely chopped spring onions, 1 tablespoon finely chopped fresh parsley, 1 tablespoon finely chopped fresh dill. Add ground black pepper to taste. Finally, I dedicate this post to Mark and Cas. Maybe now you'll stop Skyping me at dinner time saying "What do I do to make sour cream/mayo again?" Before we get to the yummy food, I'd just like to mention that I have finally put up my About Page. I should have done it a long time ago, but I really struggle with writing about myself. 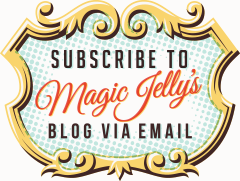 My Google Analytics tell me that little Magic Jelly Story book on my sidebar gets clicked a lot, so it was pretty remiss of me to leave that page empty for so long! Now, on to dessert... Whenever I buy a new vegan cookbook I go straight to the index to check out the cheesecake recipes. I am always so disappointed if the recipe starts with "2 tubs Tofutti cream cheese" - I just really prefer making things from scratch. It's so much more satisfying, usually tastes better, & you know exactly what the ingredients are. The other good thing about this recipe is that you can make it with whatever non-dairy milk you like, so it can be soy free if necessary. I made the cheesecake in the photo with almond milk. It's easy to make a gluten free version too by using GF biscuits in the crumb base. This recipe is for a classic lemon cheesecake, but I've provided some ideas for variations. Just think of the "cheese" mixture as a neutral base that you can flavour however you like. It's not tasty enough to be eaten alone in place of cream cheese, but works perfectly as a ricotta/Tofutti alternative for cheesecake. But you needn't stop there - you can also use it as a creamy base for dips & spreads, etc. For example, last Christmas I used the "cheese" mixture to make a caramelised onion dip, as well as adapting this cheesecake recipe to make a Chocolate & Raspberry Cheesecake. I added toasted hazelnuts & cocoa powder to the crumb base, omitted the lemon & added melted dark chocolate to the cheese mixture, then when the cheesecake had baked, pierced the top all over with a skewer, drizzled it with Cointreau, then decorated the top with raspberries & poured an agar-based raspberry & Cointreau gel over the top. It was dee-licious! White Chocolate and Passionfruit Cheesecake. Firstly, grease & line a 20cm (8 inch) round spring-form cake tin. Line the sides as well as the bottom. Drain & rinse the cashews & put them into the bowl of your food processor with half a cup of milk & process to a thick paste. It will probably still be a bit grainy, but that’s okay. Pour the cashew mixture & remaining half a cup of milk into a saucepan & heat very gently, stirring with a silicone spatula making sure it doesn’t catch on the bottom. Add the apple cider vinegar, salt, & agar powder that you've blended to a smooth paste with the 2 tablespoons of extra milk. Keep stirring until the mixture has thickened & is gently simmering. Allow to simmer for 5-10 minutes, stirring constantly – don’t let it catch! Stir in the beans & canola oil, allow them to heat through for a minute or so, then take the saucepan off the heat & blend with a stick blender until smooth. Pour the mixture into a container & put it in the fridge until it's chilled (the cheese mixture may be made a couple of days in advance). Break the biscuits up a little & process until they are fine crumbs, add the sugar if using. Then drizzle in the melted butter with the food processor running. Spoon the crumb mixture into the spring-form tin, leveling out to an even thickness & pressing down with the back of a spoon. Place all cheesecake ingredients into a food processor & process until well combined, then pour into the spring-form tin, over the crumb base, & smooth the top if necessary. Bake at 160C (320F) in a preheated oven for about 90 minutes (but keep an eye on it in case it cooks more quickly in your oven). It should be golden on the edges & coming away a little from the tin, & just set in the middle. Once you've taken it out of the oven, allow it to cool in the tin for at least 60 minutes before removing, then refrigerate once it has cooled. It is not as prone to cracking on the top as ricotta based cheesecakes, so you don't need to worry about cooling it down gradually in the oven. Please note: if you're not making a lemon cheesecake, the lemon juice should be replaced with 1/4 cup of some other kind of liquid, such as extra non-dairy milk, or else the cheesecake won't be as moist. Add 1 tablespoon cocoa powder to the crumb base mixture. Omit the lemon & drizzle 125g (4.5oz) melted chocolate into the cheesecake mixture whilst processing. Omit 1 tablespoon of the cornflour or the cheesecake will be too firm when chilled. Replace the lemon juice with 1/4 cup non-dairy milk, or maybe some coffee or liqueur. Omit the lemon, adding 1/4 cup non-dairy milk in place of the juice. Once processed, remove just over half the cheesecake mixture & drizzle 60g (2oz) melted dark chocolate into remaining mixture whilst running the processor. Dollop the plain & chocolate mixtures into the springform tin alternately, then swirl them with a knife to create a marbled effect. Omit the lemon & drizzle 200g (7oz) melted vegan white chocolate into the cheesecake mixture whilst processing. Reduce the caster sugar to 1/2 cup, reduce the cornflour to 1 tablespoon, & increase the 1/4 cup non-dairy milk (that's replacing the lemon juice) to 1/3 cup. Decorate the chilled cheesecake with passionfruit pulp (canned is okay) thickened with agar or cornflour. Use coconut milk as your non-dairy milk in the cheese mixture, replace the lemons with limes, add shredded coconut & toasted macadamia nuts to your crumb base, & decorate chilled cheesecake with passionfruit pulp or orange juice thickened with agar or cornflour poured over pineapple slices. Maybe serve with a mango coulis. Scrape a vanilla pod into the cheese mixture whilst it's cooking, omit lemon from cheesecake mixture, replacing juice with 1/3 cup non-dairy milk. You might like to add toasted nuts to the crumb base, such as walnuts, hazelnuts or almonds, & decorate the chilled cheesecake with fresh berries. Judging by the recipes I've posted, you'd think I spend all my time making vegan egg & dairy alternatives. I do make other things, but I figure that these recipes are more of a novelty & people might appreciate it if I share my experiments. I might post some more "normal" recipes in future, but for now, I give you the Vegan Poached "Egg". In the photos, I've served mine on a toasted crumpet with wilted baby spinach, some little crispy pan-fried bits of homemade smoky maple seitan , & ground black pepper. Transitioning over from vegetarianism to veganism, one of the things I've missed most is eggs for breakfast - breakfast is my favourite meal of the day! But I used to have occasional phases where I was totally off eggs & found them icky, so vegan eggs are much better in lots of ways. Rather more time & effort is needed than simply cracking an egg, but it's worth it, & the good thing about this recipe is it makes four "eggs" & you can reheat any leftovers in the microwave. Another couple of notes on my recipe... Since taking these photos, I've reduced the amount of margarine in the "yolk". Although it tasted good, as it warmed up while poaching, the sauce split a little. I could have added some extra cornflour to emulsify it a bit more, but didn't want the consistency any thicker, so reduced the fat content instead (which isn't a bad thing!). The brand of tofu you choose will affect the texture & flavour. It must be Silken Firm Tofu. If it's not silken, it will be too grainy, & if it's not Firm Silken, it will be too soft to hold together. If you're in Australia, I recommend TLY Joyce Silken Firm Tofu. It's very mild with only a slight tofu-y taste, so works perfectly here (& is great for making desserts too). It's readily available in most supermarkets & is only around $2.00 a packet. The first time I experimented with poaching a tofu egg, I just used arrowroot flour in the white mixture. It was okay, & held together well, but I found the texture a tad too soft & pasty, so next time, I added a little agar agar powder to get the texture closer to a soft poached egg. I know that powdered agar isn't readily available everywhere -& you can not use agar flakes instead because they probably won't dissolve & gel properly just from gentle poaching -so if you can't find agar powder, just omit it. Lastly, I use silicone egg poaching pods & my trusty old cast iron frying pan with a glass lid. Four of them fit in easily. I recommend these pods because they're so easy to use, but I guess it depends on what you have at hand. I think that covers everything. Recipe below! Blend together all the yolk ingredients (except the margarine) until smooth & heat gently in a saucepan, whisking in the margarine as the mixture thickens & starts to simmer. [Edit: You can also blend the yolk ingredients together until the mixture is free of lumps & zap it in the microwave at 15-20 second intervals, whisking each time, until it has thickened & started to bubble.] Remove from the heat & pour into a bowl, placing some clingfilm on the surface so a skin won't form. Put it in the fridge or freezer to cool down - it must be totally cooled before you can assemble your eggs. Blend together all ingredients with a stick blender or in a food processor until smooth & creamy. You might like to spray or brush your egg poacher with a little oil, although it's not really necessary if using silicone poaching pods. Spoon a generous tablespoonful of the tofu mixture (egg white) into each pod & make a well in the centre with the back of a teaspoon, spreading the mixture a little up the sides of the pod. Make sure the tofu mixture isn't too thin on the bottom though - you don't want the yolk breaking through. Spoon between 1-2 teaspoons of the yolk mixture (about the equivalent of a regular egg yolk) into the well you've made, making sure it doesn't seep to the edges of the pod - you want to make sure the yolk is totally encased within the tofu. Gently spoon a little more of the tofu mixture over the top of the yolk, smoothing the top of the egg. In a pan, bring some water to a gentle simmer while you're assembling the eggs. Gently lower your filled poaching pods into the pan (the water level should be about 2.5cm/1" once the pods are in) & place a lid over it to help the eggs cook evenly. Adjust the heat if necessary & simmer gently for about 10 minutes (this gives you plenty of time to toast your toast, make a cup of tea, etc). The texture should be firm, but still tender & springy (not rubbery! ), much like a regular poached egg. If a little water has formed on the top due to the steam, pour it off carefully, then flip your egg onto your plate. When you break the white open, lovely yellow yolky sauce will ooze out all over your toast - yum! Sauté the red onion in the margarine with the cumin for a couple of minutes (it's fine if it's still a little firm). Whiz the tofu, cashews, vinegar & yeast flakes in a food processor until well combined (it doesn't have to be totally smooth) & add a dash of water if it's a little stiff. Combine the tofu mixture with the other ingredients in a bowl. Season to taste. Now to forming the dough... You're supposed to roll out a circle, put a blob of filling in the middle, pinch the dough together to cover the filling, then roll it flat, but I always find my filling escapes when I do that, so I cheat a little, which has the added benefit of holding more filling! Take a quarter of the dough, cut that in half, then knead each piece lightly, & roll into two equally sized circles on a lightly floured bench. Spread a quarter of the filling onto one of the circles, leaving a 1cm (1/2 inch) border around the edge. Moisten the edge with a little water, then gently press the other circle over the top, sealing the edges so the filling won't escape. Then really gently roll the kulcha both sides with your rolling pin. Mine worked out about 20cm (8 inches) in diameter, which as I mentioned earlier, gave me a bread a little thinner than kulchas normally are, so you might like to aim a little smaller if you want the bread thicker. Heat some olive oil (just a little) in a moderately hot skillet & cook the kulchas both side until they start to bubble & puff & are nice & golden. Eat immediately. There are a number of vegan cheeses on the market, but they're rather expensive, & some of them contain ingredients I don't particularly like (such as hydrogenated oils & soy protein isolate). Then there are the tantalising sounding brands that aren't available in Australia, such as Daiya, Vegusto & Dr. Cow (I wish I could try them!). Anyway, I do like to make things from scratch & enjoy a challenge, so I set about making my own vegan cheese recipe that slices, grates, melts, & of course, tastes good too. I've got the melting bit covered, as you can see from my photos below, & it's a little stretchy & oozy (perfect for toast & pizzas). However, it is a rather soft cheese - at room temperature, rather like a camembert - but you can slice it if it's well-chilled, & you can grate it if you pop it in the freezer for a couple of hours first (I keep a ziplock bag of it pre-grated in the freezer), & it spreads really well on sandwiches & crackers. It also blends easily into sauces (I made a cheese & pesto pasta sauce that was delicious!) & works great as a base for dips. I've yet to try it in mac & cheese, but I'm guessing that would be an oozy, gooey cheesefest, & you can also make cheese balls (mandatory holiday fare! ), rolled in chopped nuts, herbs or spices. Although not as robust in texture as dairy cheese or some of the commercial vegan cheeses, it's still pretty versatile. I've used soy milk in my recipe, but you could use any non-dairy milk you like to make a soy-free cheese (I might experiment with cashew cream or almond milk next time). The milk might not curdle as much when you add the vinegar, but I really don't think that would matter. Just bear in mind, I have only made this recipe with soy milk so far, so I can't vouch for any modifications! Lastly, a little word on the fat content. It is fairly rich, but it's cheese after all, & intended to be eaten in small quantities. If you want to cut back on the fat, I'd reduce the margarine content (but leave the coconut oil, as that's more integral to the texture) - it might affect the meltiness though. Pour one cup of the soy milk into a small saucepan with the vinegar & let sit for a minute or so until thickened & curdled. Stir agar agar powder into 1/4 cup of the remaining milk until there are no lumps, & set aside. Whisk the cornflour, chickpea flour, potato starch & arrowroot into the remaining 3/4 cup of soy milk until smooth, & set aside. Please note: It's the blend of these particular flours that gives the cheese its texture, so it might not be a good idea to substitute them for other flours! Stir the agar agar mixture into the soy milk & vinegar in the saucepan, & on a low heat, bring to a gentle simmer whilst stirring regularly. Make sure the mixture doesn't catch on the bottom of the pan. Whilst bringing it to a simmer, add the margarine, coconut oil, nutritional yeast, salt, & liquid smoke (if using). Allow the mixture to simmer gently for 2-3 minutes, to allow the agar agar to dissolve, then pour in the soy milk combined with the flours. Stir continually as it thickens. Eventually the mixture will begin to come away from the edges of the saucepan, much like a roux. Don't worry if it appears gloopy, we're going to blend it! Now's the time to taste it & see if it needs anything. Also make sure the flours have thoroughly cooked & there's no floury taste. At this stage, it really does look like a big oozy lump of melted cheese - yum! Take the saucepan off the heat & then blend the cheese for a minute or two with a stick blender. This is an important step, so don't leave it out! Blending the mixture will help emulsify it & the cheese will become smooth & glossy, like a fondue. Pour it into a lightly oiled mold or container as soon as possible. If it sits for too long, it can start to separate a bit, but you should have enough time to add any nuts, herbs or other flavourings before pouring it into a container. You could use some soy lecithin or xanthan gum to emulsify/stabalise it, but it's unnecessary if you work fairly quickly - it's nice to leave out any unnecessary additives. Then you just need to chill it in the fridge - overnight is best - the more well-chilled it is, the easier it is to slice. Makes a really big block & will keep in the fridge for about a week.